Truly the ultimate textbook of farrier science and craftsmanship for the 21st century. Written by two experienced authors - together, they bring a fresh NEW approach to learning the vital craft of horseshoeing. This new, updated, expanded third edition shows you how to help horses stay sound or return to soundness. 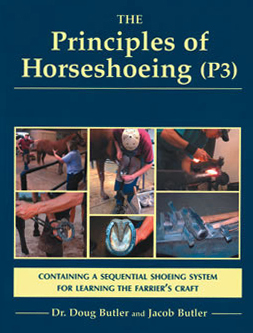 Nowhere else will you find as complete a collection of foot knowledge as in The Principles of Horseshoeing (P3). This is the one resource that is a MUST for the library of every farrier, veterinarian, and horse lover, and it is a recommended resource for AFA certification programs.